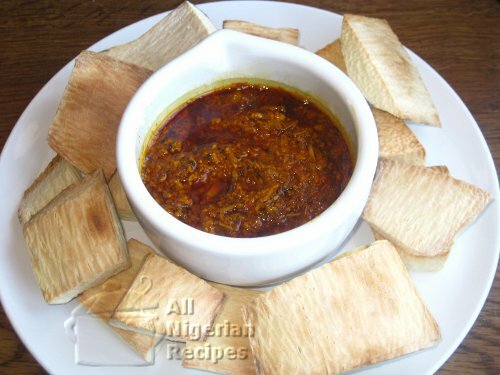 Add some fish (preferably mackerel) in the barbecue and you will be wondering what you have been doing by not trying this Nigerian yummy recipe before now. Ripe / Unripe Plantain: as much as you can eat! Prepare the pepper sauce to go with the roasted plantain and set aside. Wash and peel the unripe / ripe plantains to be roasted. Wash and cut the fish, remove the insides and sprinkle salt on them. Set up your barbecue on medium heat as the plantain needs to be roasted slowly. If using an oven, set to grill and a temperature of 150°C. When the barbecue is heated, place the peeled plantains and fish on the barbecue grids to start roasting. Remember to turn the sides from time to time for an even roast. Note: When using an oven, place the peeled plantains on the grill rack and place the rack as close to the grill as possible. The heat should be between 150°C and 200°C as the plantains need to be roasted slowly. For ripe plantains, you can start off with 170°C and when you see the plantains browning, you can increase to 200°C. For unripe plantains which need to be roasted at even lower temperatures, start with about 150°C. Check from time to time and turn the plantains on all sides to ensure an even roast. When the plantain is perfectly roasted, place the pepper sauce on the grid to heat it up. You'll know they are well-roasted when they look like the ones in the picture. The roasted plantain is ready to be served. Dip the roasted plantains in the pepper sauce to eat. Wash it down with a chilled carbonated drink. Then go and take a nap because that's the only thing you want to do after this meal.